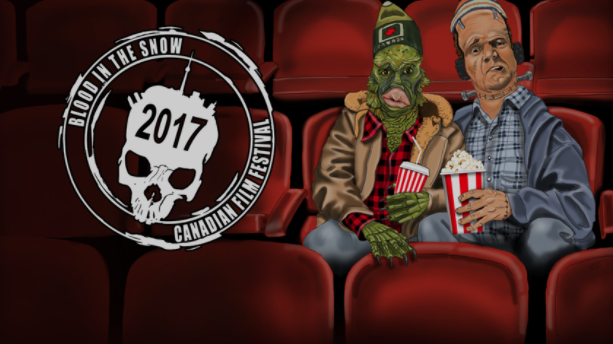 Official Release: The BLOOD IN THE SNOW CANADIAN FILM FESTIVAL (“BITS”) returns for a sixth year of thrills, chills, and bloody Canuck carnage. With ten programs over four days, BITS 2017 promises to be the biggest and baddest celebration of Canadian horror, genre and underground film ever seen. BITS is proud to announce this year’s lineup, which kicks off with the world premiere of the vampire apocalypse film RED SPRING, the directorial debut from Toronto’s own Jeff Sinasac. The slate spans all ends of Canadian genre from the sci-fi martial arts flick KILL ORDER by James Mark, to the haunted route down BUCKOUT ROAD, from Matthew Currie Holmes, and the doc-style whodunit, FAKE BLOOD directed by Rob Grant. And BITS always feels more complete with a good holiday slasher like ONCE UPON A TIME AT CHRISTMAS, directed by Paul Tanter. The fan favourite BITS SHORT FILM SHOWCASE is back in prime time with shorts from BITS veterans including Gigi Saul Guerrero (BESTIA) and Tyler A. Williams (BEHIND THE CURTAIN), as well as new comers like G-hey Kim (DON’T CLICK) and Alyx Melone (TALKING HEADS). The fest closes with the much anticipated return of award winning director, Audrey Cummings, with the Canadian premiere of DARKEN, featuring Christine Horne (Hyena Road) and Ari Millen (Orphan Black), and starring Natasha Negovanlis (Carmilla). BITS 2017 continues its popular workshop series, featuring panels with some of the biggest names in Canadian genre filmmaking. Topics this year include Horror in Virtual Reality, the Shorts-to-Features workshop, and the Kickass Women of Canadian Horror. The panels take place at The Monarch Tavern, which is also the new home of the infamous BITS AT THE BAR after-parties. The world has ended, taking humanity with it. With vampires numbering in the millions, humans have become an endangered species. It’s against this backdrop that we meet Ray – a loving husband and father searching for his wife and daughter. Joined by a group of survivors dealing with their own grief and anger, his search takes them through Ontario until they meet another who offers a chance at life and respite from their vampiric predators. But how can safe harbour be found when danger stalks them at every turn? Blood Child a supernatural horror thriller based on a true story. A young woman, Ashley DiAngelo suffers a devastating miscarriage. In a desperate attempt to get over the agony of losing her child, Ashley resorts to the South East Asian black magic practice of raising her own “ghost child”. She seeks the help of her Indonesian maid, Siti, and tasks her to find a “bomoh” (witch doctor) who is able to trap the soul of unborn children. However, what Ashley does not realize is that there are terms and conditions attached to raising a ghost child. When Ashley finds herself pregnant again, a series of terrifying events begin to unfold in the DiAngelo home. The family soon learns that the ghost child is not about to play second fiddle to the impending new addition to the family and unleashes an unspeakable evil upon the family. Two filmmakers receive a disturbing fan video inspired by one of their horror films; motivating them to investigate their responsibility portraying violent cinema and introducing them to the real world of violent criminals and their victims. A special feature length program of premieres of the hottest new Canadian short genre films. Anna and Ellery discover different interpretations of the word “fun”. In the middle of the night, a man is haunted by the manifestation of his fears. Phil and Gerty play their usual Sunday afternoon game of “Letters”. But today is different. Something dark boils below the surface of the game, setting off a series of unexpected events, forever changing their marriage. A man with an uncontrollable Itch on his hand goes through increasingly extreme measures to get rid of it. A young man watches a snuff film sent to his email. When the film stops half way through, he has the option to continue. To find out what happens next, all he has to do is click. Sensing a strange presence, Lauren awakes to a seemingly empty home. Upon investigation, she soon realizes that there is something much darker at play. A couple of backwoods hicks discover a time machine in the woods. Rather than use it to do something smart, like bet on sports or game the stock market, they use it to hunt each other. Repeatedly. It seems like an ordinary night when Emily turns out the lights in her apartment, little does she know that her night would become a living nightmare. BESTIA follows the lone survivor (played by Mathias Retamal) of a disaster as he awakens on a deserted beach. It becomes clear that there are more dangers lurking in the woods than a hungry beast. A serial killer continues his macabre hobby during a zombie outbreak. Inspired by true events, residential school survivor Jacob Wematim (Julian Black Antelope), struggles to hang onto his family, land and identity as his personal demons threaten to manifest in the form of the Wendigo spirit (Wilma Pelly) and take it all away. An expectant couple’s intimate weekend turns to terror when they discover their secluded country inn is a haunted maternity home where unwanted infants and mothers were murdered. Inspired by the true story of the infamous ‘Butterbox Babies’, THE CHILD REMAINS is a twisting supernatural thriller that emphasizes story and suspense over shock and gore. From the producer of the acclaimed horror thriller The Corridor, starring Cannes Best Actress winner Suzanne Clement (Mommy), Allan Hawco (Frontier), Shelley Thompson (Labyrinth) and genre hero Geza Kovacs (Scanners, The Dead Zone), THE CHILD REMAINS is about the evil that lurks behind the postcard. After losing his family in a car accident and seeing his latest work bomb, famous novelist, Kennedy Sait, becomes a recluse and turns to drugs and alcohol to numb the pain he feels. Struggling to make it through day-to-day, Kennedy’s life is turned around after meeting his neighbour’s new wife, Patricia. Infatuated with her, she becomes his “muse” and she not only inspires him to create again, but she also inspires him to live again. But his infatuation with her becomes a dangerous obsession. To ensure he doesn’t lose Patricia, he kidnaps her and keeps her prisoner in his attic. Police comb the neighbourhood, hoping to find a trace of the missing woman, never knowing that she is right under their noses the whole time. Patricia tries keeping a level head and is always looking for a way to escape, though she fears she may never break free of her capture as Kennedy’s grasp on reality continues on a frightening downward spiral. This entry was posted on Tuesday, November 7th, 2017 at 4:58 pm	and is filed under Events, Film, News. You can follow any responses to this entry through the RSS 2.0 feed. You can skip to the end and leave a response. Pinging is currently not allowed. « ‘Summer of ’82 – When Zappa Came to Sicily’ Coming to Theaters and Home Video!